Get ready to eat beans in a spectacular way. You will eat beans like you had never eaten them before. You will eat beans under the version of charro beans. 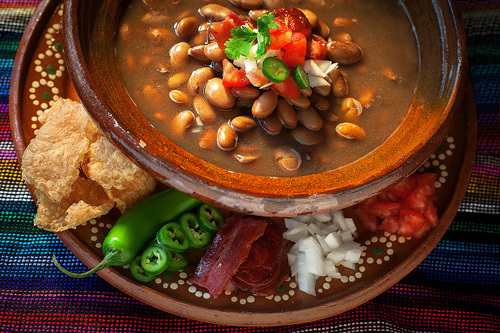 The charro beans are unique since in this dish the beans are immersed in a world of ingredients and flavors . Imagine a plate with beans that also has ham, tomato, bacon, chorizo and many more ingredients. Those are the charro beans. A typical recipe from Northern Mexico.... although Jalisco claims the origin of the dish. As it may be expected the charro beans flavor is elaborated, strong and a bit spicy. The dish is brothy and very succulent. It is excellent to accompany with grilled steak although it could also be served as entree plate. And if you want to experience deeper the charro beans serve them for breakfast next to some ranch style eggs. In this recipe various steps will be performed, which will keep you entertained. The charro beans are prepared with cooked whole beans. If these beans are bought canned the flavor is not that good but if you prepare the pot beans and use them in this recipe the flavor is going to be sensational. Normally the charro beans are prepared with pinto or bayo beans. Did you know that you can prepare the chorizo that is used in these beans. In 30 minutes the beans will be ready. Cut into small chunks 3.5 oz of chorizo and 3.5 oz bacon; then set aside. Dice 1.7 oz of ham, 1/2 onion and 2 tomatoes; then reserve. Finely chop 2 serrano peppers, 3 garlic cloves and 3 coriander sprigs; then set aside. Heat in a frying pan over medium-high heat 1 tablespoon of olive oil. The small Chorizo chunks that were cut. The small Bacon chunks that were cut. Mix all the frying pan ingredients and fry them for about 2 minutes, until they are lightly fried and they release some of their fat; stir regularly. The Onion dices that were cut. The Garlic cloves that were minced. Mix the frying pan ingredients and fry them for approximately 1 minute, until the onion looks a bit transparent; stir regularly. The dices of the Tomatoes that were cut. The Serrano Peppers that were minced. Mix the frying pan ingredients and fry them for about 2 minutes, until the tomato and the chili are lightly fried and soft; stir regularly. Add in the frying pan the ham dices that were cut. Mix the frying pan ingredients and fry them for approximately 1 minute, until the ham is moderately fried; stir regularly. Transfer from the frying pan to a saucepan all the ingredients that were fried. 1.1 lbs of Cooked Beans with Broth. 1.7 oz of Pork Rind in small pieces. Approximately 1 cup of Water (8.4 fl oz), until having the consistency of a watery soup. When the broth boils reduce to low heat, cover the saucepan and cook the charro beans for about 15 minutes, until they thicken a little; stir occasionally. The Coriander that was minced. Be careful with the salt in this recipe because the chorizo, the ham and the bacon are already salty. Mix the saucepan ingredients and cook the charro beans without lid for about 5 minutes, until they thicken; stir occasionally. Tip: If you have a small clay cazuela , use it to serve the charro beans because they will look spectacular. Variations: The beans are also used to make soups and creams. Did you like the Charro Beans? This is a beautiful handmade Mexican Cazuela, which is perfect to serve the charro beans. You will have the best presentation! The “Chorizo Palacios" is an excellent chorizo for its flavor, consistency and texture. Perfect for these beans. If you don’t have pork rind available, you can use this. Unfortunately it is not as good as the fresh prok rind but it will do a good job in the charro beans.